MayDay protest against Detroit bankruptcy, emergency management blocks Woodward Ave. May 1, 2014. 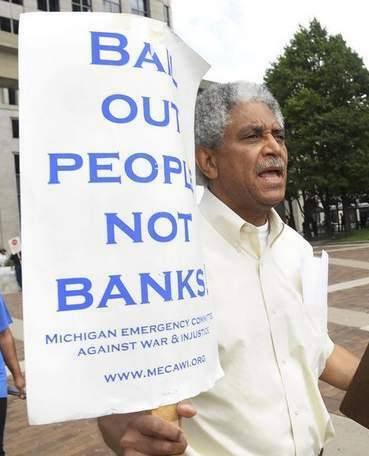 Detroit—City retirees and citizens, all without lawyers, faced off against Emergency Manager Kevyn Orr and other corporate profiteers in court Oct. 15, as the largest Chapter 9 bankruptcy case in U.S. history proceeded to a close at breakneck speed. Those who testified had filed objections to the Plan of Adjustment (POA), then compiled motions and briefs, identified witnesses, and stood proudly in court to present their cases. They had been given only one day’s notice, a phone call from the bankruptcy clerk, to appear at the hearing, which lasted about three hours. U.S. Bankruptcy Judge Steven Rhodes had previously killed many other motions by pro se objectors. 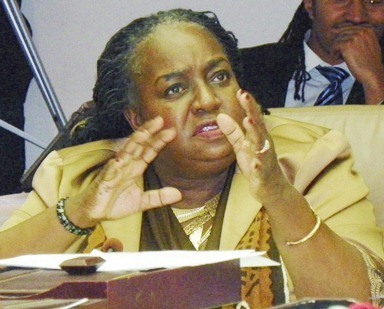 Fredia Butler, a dignified well-dressed senior citizen, who attended the hearing with Stop the Theft of Our Pensions Committee leader Ezza Brandon, hit the nail on the head during her testimony. Slavemaster Gov. 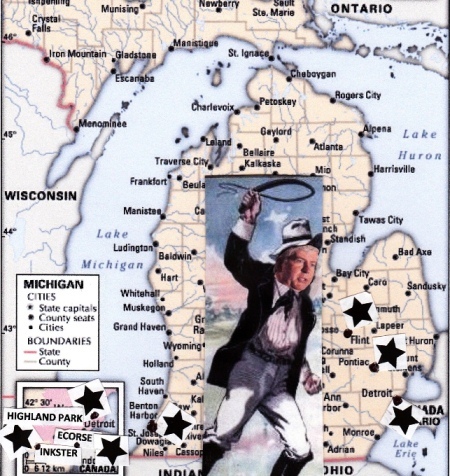 Rick Snyder takes over Michigan’s Black-majority cities, including Detroit, under Emergency Manager laws. She also noted the seizures of the city’s assets including the Water Department, Belle Isle, and art owned by the city in the Detroit Institute of Art. Detroit is the only city in the U.S. undergoing bankruptcy proceedings filed by an unelected official, Orr. Stockton and San Bernadino, CA filed over a year before Detroit did, but have not yet reached the POA stage. UNBIASED? Judge Rhodes chairs Oct. 10, 2012 forum on Chapter 9 and EM’s with one-sided panel including (l to r) Frederick Headen, state treasury official who has led many takeovers, Edward Plawecki, Emergency Manager trainers Douglas Bernstein and Judy O’Neill (who co-authored Michigan’s original EM law, PA 4), and Charles Moore of Conway McKenzie, a chief witness for Jones Day at the bankruptcy trial. 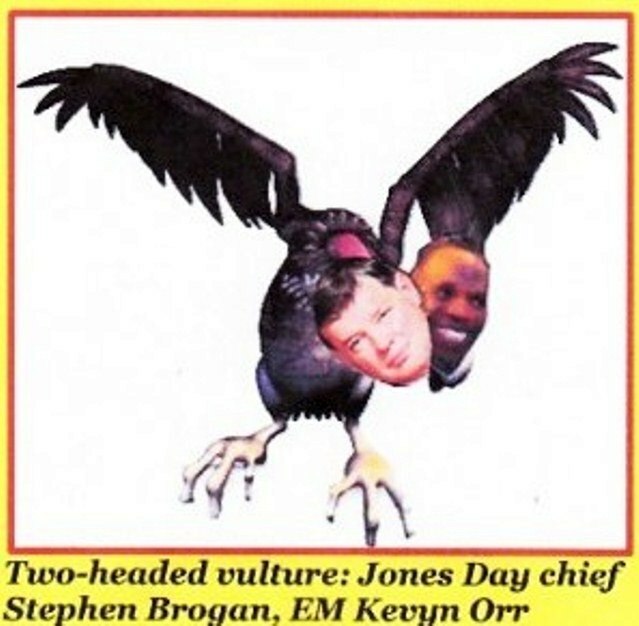 In this case, U. S. Bankruptcy Judge Steven Rhodes early on recognized Detroit Emergency Manager Kevyn Orr as the debtor, in response to a motion by his “former” employee, Jones Day, which Rhodes recognized as representing the City of Detroit. U.S. Bankruptcy Judge Steven Rhodes heard the mostly Black objectors as he awaited a settlement with the city’s largest hold-out creditor, Financial Guaranty Insurance Corporation (FGIC), on a claim of $1.1 billion, the following day. He said during the hearing he expected to hold closing arguments by Oct. 21 or 22 next week. Former two-term City Councilwoman JoAnn Watson said the state has a conflict of interest in “shepherding” Detroit into bankruptcy. “The state is a debtor to the city,” she explained, saying it owes Detroit at least a billion and a half dollars. JoAnn Watson pleads her case at an earlier Detroit City Council meeting. She and three others voted NO on the consent agreement which led to the appointment of an Emergency Manager. She cited a recent report from the Michigan Municipal League which showed that the state has deliberately withheld $732 million in revenue-sharing to Detroit over the last 10 years. She also said the state reneged on an agreement between former Governor John Engler and former Mayor Dennis Archer to increase revenue-sharing in exchange for decreasing taxes on non-residents. As a result, she said, the city lost an additional $224 million in revenue sharing and $600 million in non-resident income taxes. Orr/Jones Day have reportedly offered to withdraw that lawsuit in exchange for a settlement with FGIC. 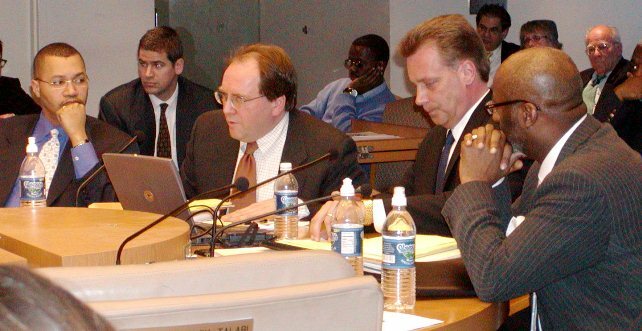 Jan. 31, 2005: Fitch Ratings Joe O’Keefe (at mike) with Stephen Murphy of Standard & Poor’s press City Council to approve disastrous $1.5 Billion POC loan. They are assisted by then Detroit CFO Sean Werdlow, who shortly afterwards took a high level job with one of the lenders, and (r) Deputy Mayor Anthony Adams. Much of the testimony centered on a 6.75 percent interest rate attached to the so-called “claw-backs” from retirees’ annuity savings funds (ASF), large cuts which would last the lifetime of retirees and beyond, affecting their beneficiaries. While retirees themselves contributed the money, Orr/Jones Day contended the payments they received included interest rates that surpassed the going rates of return. Retirees did not discover the facts about the rate until a July 17 and July 21 bankruptcy hearing after they had already voted on the plan. Retiree Stephen Wojtowicz brought it to light then. During the Oct. 15 hearing, many demanded that both the interest and the entire ASF clawbacks be eliminated from the plan. 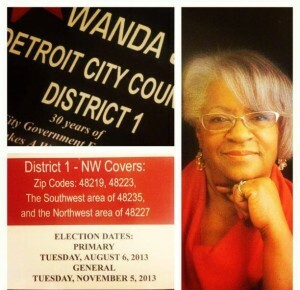 Wanda Hill during earlier run for City Council. City retiree and former City Council candidate Wanda Jan Hill calmly and professionally queried Orr himself as part of an apparently thoroughly researched presentation on that issue. She went back through the various Plans of Adjustments (there are now seven) as well as numerous other documents that failed to include any mention of the 6.75 percent interest rate. Jones Day attorney Heather Lennox rushed to the witness stand to make up for Orr’s lack of expertise. Coughing nervously, she argued that ballots listed the actual amounts resulting from the additional interest, and that the actual percentage was in the disclosure statement, and was discussed at two informational meetings for retirees in metro Detroit. She said she assumed pensioners understood the complicated ASF process at the time of their retirement. Walter Knall is earlier protest against EM takeover, bankruptcy. She argued that if retirees had known about the interest rate, they may have voted against the plan. Elaine Thayer, representing her city retiree mother as well as her “significant other,” called the lack of disclosure of the interest rate “fraud” under the legal definition of the term. Retiree Walter Knall blasted the ASF cuts and the undisclosed interest rate. 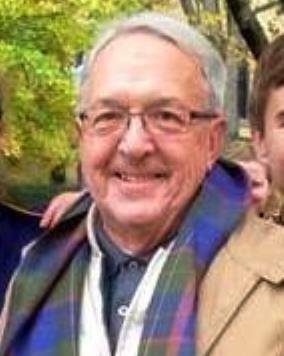 He concurred with objections including citations of state and federal laws violated, wich were filed by Law Department retirees James Karwoski and John P. Quinn. Karwoski is himself an attorney who did not testify, but said he has participated in the bankruptcy hearings by cross-examining witnesses and plans to participate in closing arguments as well. He said he felt the retirees who did testify did very well in presenting their cases. Retirees McClellan and Yvonne Williams-Jones called David Kausch, chief actuary for the global firm Gabriel, Roeder and Smith (GRS) to the stand. GRS has done actuarial reports for Detroit’s retirement systems for 75 years. Earlier, it contested the Orr/Jones Day estimate that the systems are underfunded by up to $3.5 billion, based on a report by Milliman, Inc. that was never completed. They issued a statement in June criticizing the Milliman estimate, available at link below story. Kausch testified that the General Retirement System is 70 percent funded as of June 30, 2013. In 2012, it was 77 percent funded, and in 2011, 83 percent funded. Those percentages actually exceed those of the State of Michigan and other large cities in the U.S.
Kausch said long-term solvency is based on cash contributions to the system from both employees and employer over time. The City of Detroit stopped its federally-mandated contributions to the System when it declared bankruptcy, so they are not included in the 2013 report. It does not intend to reinstitute them until 2023 under the proposed Plan of Adjustment. It wants to replace them with a one-time “Grand Bargain” payment of $816 million that is not yet fully in place and nowhere near commensurate with what payments would have been. Kausch said the Great Recession of 2008, caused by Wall Street itself, was responsible for losses to pension systems across the U.S. He said the retirement system is gradually recovering along with the economy. For solvency, he said, “the city must make contributions on a continued basis.” Under the Plan of Adjustment, he said, the city has proposed adjusting interest rates down to 6.75 percent. “That means they are assuming the system’s assets are not going to grow as fast,” Kausch said. He explained that means the city’s required contributions will increase in order to maintain required payments to retirees. Stephen Wojtowicz, who first exposed the 6.75 percent interest rate on the ASF recoupment, pointed out that while the system lost money during the Great Recession, in other years it earned rates as high as 22 percent while paying out only the standard 7.9 percent to retirees and returning the remainder to the system as a whole. Many local mainstream media reports mocked the retirees’ testimony and questioning of witnesses as unprofessional, although Attorney Karwoski said it was handled very well. 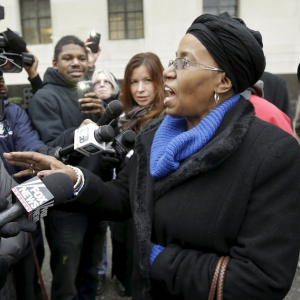 In a covertly racist and insensitive comment, Christine Ferretti of the Detroit Free Press, a young white reporter, said Ms. Butler “was allowed to wear a floppy hat,” and left out the essence of her testimony that the bankruptcy is a profound racist assault on the people of the nation’s largest Black-majority city. In contrast, Reuters reported largely on Ms. Butler’s testimony (see link below) and a local TV anchor was seeking her out for an interview during the break. However, Ms. Butler had already left. This just shows how awesome Detroit retirees are. 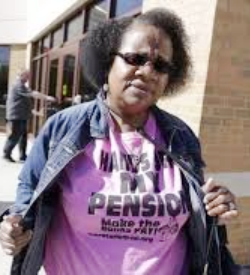 No current elected officials, union leaders or others who SHOULD BE standing up for the rights of the people of Detroit and retirees ARE DOING THEIR JOBS to protect the people and fight this racist right wing takeover. I would like to thank you so very much for your very thorough and truthful replay of what happened in the Federal Court room 242 on October 15, 2014. We have been fighting for what we earned rightfully. We have also watched our so-called leaders desert us when we could have benefited from their support. It’s alright because as long as we have people such as yourself among us we can and will rise above the rhetoric. This article gives an excellent representation of retirees court presentation of their objections to the Chapter 13 filed by Kevyn Orr EM via State instructions. Thanks for providing fair and through coverage.